Audi is testing factory vehicles powered by used lithium-ion batteries at its main plant in Ingolstadt. Audi is obliged by law to take back energy carriers after they have been used in cars because they still have a large proportion of their original charging capacity. 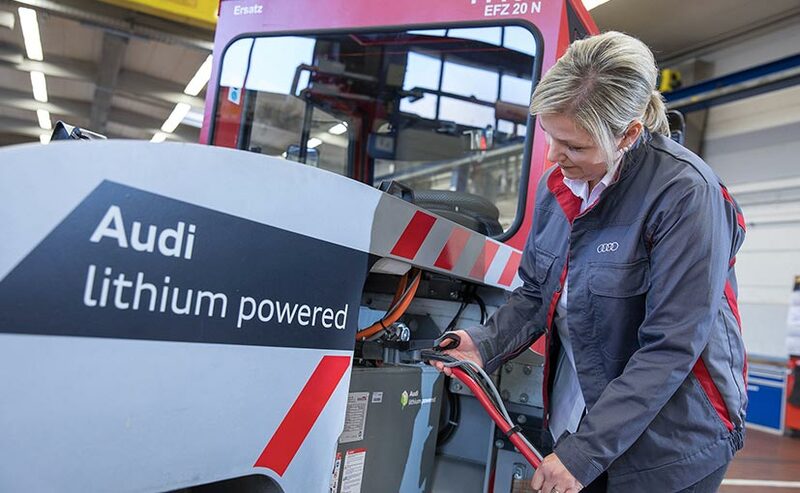 Audi is testing factory vehicles powered by used lithium-ion batteries at its main plant in Ingolstadt. Audi is obliged by law to take back energy carriers after they have been used in cars because they still have a large proportion of their original charging capacity. An interdisciplinary project team is now investigating how batteries from the Audi e-tron test vehicles, for example, or from hybrid models such as the Audi A3 e-tron and Audi Q7 e-tron, can continue to be used sensibly. A number of other advantages have already become apparent during the test phase. 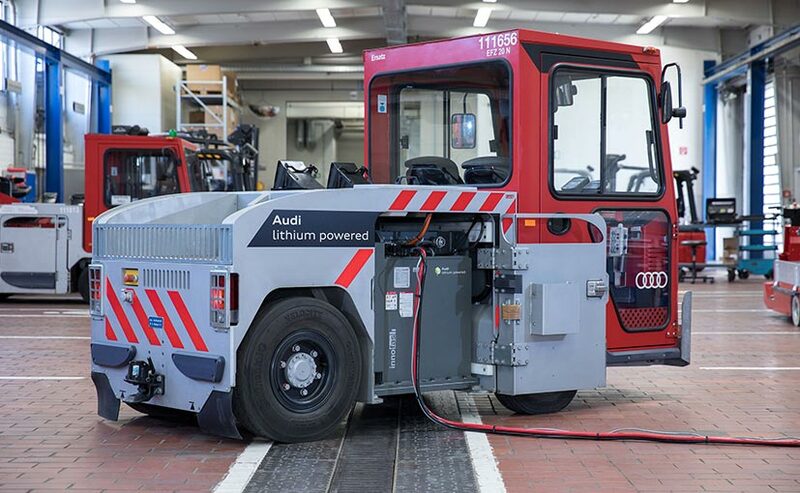 Factory vehicles in Audi's production plants such as fork-lift trucks and tow tractors have so far been powered by lead-acid batteries. When the batteries are empty, employees remove the battery packs weighing up to two tons from the vehicles and connect them to a charging station for several hours. However, lithium-ion batteries can be charged directly where the vehicles are parked during normal downtimes, in breaks between shifts for example. This saves space and also eliminates the high manual effort required to replace the batteries. Audi would save millions if it converted its entire fleet of factory vehicles to lithium-ion batteries at its 16 production sites worldwide. The battery of an Audi e-tron consists of 36 individual battery modules and is located under the car's passenger cell between the axles in the form of a flat, wide block. After the batteries are taken back, the project team checks each individual module for its continued usability. They then install 24 modules in each new battery tray. This has the same dimensions and weight as the previous lead-acid batteries of the factory vehicles, so the company can continue to use all of those vehicles without any major investments. In the future, specialised employees could take over the assembly of the second-use batteries in the company's own battery centre.